So fellow travelers, working at our local high school I see the damage that bullies inflict not only on their targets but on a community as a whole. Just last year, our community lost a very precious young life to the ravages of bullies. Every now and then I also encounter bullying from adults who should know better. Always I feel at first a flash of anger igniting remnant embers of past hurts from childhood tormentors. Yet in my heart I know anger begets more anger, perpetuating the cycle of pain. Stepping back gives me a chance to gain perspective, refocus and respond rather than react. That’s easier to do when you are a bystander, a far bigger demand if one is the target. Recently waves of hurt and anger rocked an online community I belong to, created by falsehoods lobbed by a very public persona with their own following. It was just the most recent in an ongoing cycle of attacks cleverly veiled as righteous anger at fabricated injustices. The details are less relevant than the effects. Here is where communities either stand or fall. And ours, I am proud to say, stands not only united, but stronger and closer than ever. Too often we are unaware of the pain a simple comment or action might cause others. Those who are hurting often do not realize their pain isn’t obvious until they speak up. When this most recent attempt to malign the characters of key members of the community surfaced it swiftly proved those accusations false simply by the honest, straightforward response of those attacked by this outsider. Our community is stronger because people had the courage to speak up, share their pain, admit mistakes, ask for and receive forgiveness. When a space is truly a safe haven truth can be spoken on all sides. No single voice dominates or controls the dialogue. Then clarity and healing are possible because all voices can be heard. Our community has the blessing of this freedom because it was founded specifically to create a safe haven. I have no doubts about the integrity or intentions of those who lead the group and I am grateful to be a member. 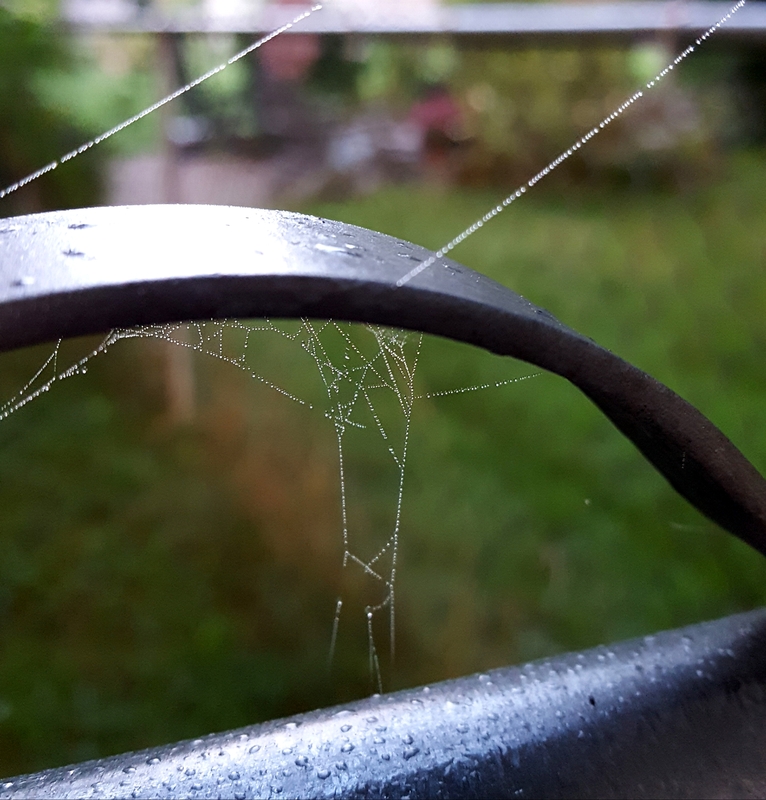 Today, early morning light and heavy dew revealed dozens of tiny spider webs draped everywhere around my yard. It’s a common late summer sign of egg sacs having hatched and hundreds of tiny webmasters were busy working under the cover of darkness. Tiny strands strung with glistening dewdrops festooned my yard like the remanents of a joyous party. A beautiful metaphor for webs of deception transformed into a celebration of friendship, iluminated by the Light of Truth. Walk gently on the path my friends and may you find true friendship along the way. Whether communities defined by city limits, political affiliation, shared beliefs or internet connections – we are all responsible for contributing to the atmosphere. I’m pleased to have found a space on WP (being a former Xangan -RIP) that has the same uplifting and welcoming nature as my last online community. It is wonderful that the community you write about has the strength to stand up for truth and justice. This is such a good post and its exactly what we were trying to accomplish. I knew some people would be angered by the honesty, but that is how it is whenever someone speaks their truth. I’m so appreciative to have you as part of my community. It’s a gift to be there.